The first time I ever made a Pesto Pasta Salad with store bought pesto, I thought, really? This is it? I was underwhelmed and disappointed because I was looking forward to luscious pesto coating hot, long strands of pasta. The pasta was too firm, (even though I cooked the pasta to al dente,) with only a hint of basil, and it just tasted flat. This recipe for Pesto Pasta Salad with Roasted Tomatoes is not altogether different from that first attempt, but it tastes worlds apart. THIS pesto salad is a glorious celebration of summer, and the difference is all in the details. I made my own pesto sauce (instead of store-bought) using fresh basil. I toasted the pine nuts to bring out their nutty flavor. Beautiful summer cherry tomatoes were roasted to make them taste like candied tomatoes, without adding any sugar. I made sure to check the seasoning and add more salt before serving, to keep the flavors tasting bright and savory. Milky fresh mozzarella provided nuggets of soft, creamy flavor and texture. Each pesto-infused bite of pasta was a revelation in my mouth, with big, bold basil flavor. I was very, very happy. Notes: I beg you to try making your own pesto at least once, (as in this recipe,) before deciding to use the store-bought kind. I have definitely used store-bought before for convenience, but when I developed this recipe, I did a side-by-side comparison of freshly made pesto vs. the store-bought pesto, and the fresh pesto blew my mind. Really. The difference was huge, and if you have a food processor or blender, fresh pesto only takes a few minutes to make. I have been overcooking my pasta for pasta salad by a minute or two ever since I read this post on Serious Eats about how pasta gets stiffer when it cools, so over-cooking the pasta a bit for pasta salad is great because it keeps the texture from getting too firm. Pine nuts are at least half of what makes pesto so darn good, but I realize they are pricey. You can substitute half or all of the pine nuts for walnuts, and it will be a suitable substitution. This Pesto Pasta Salad alongside Cynthia's Mediterranean Turkey Burgers and Mustardy Potato Salad makes an amazing barbecue. Adding shredded or diced chicken would also make this the perfect light summer meal, rather than a side. Preheat oven to 400 degrees F. Combine cherry tomatoes and 1 tablespoon olive oil on a rimmed sheet pan. Sprinkle lightly with salt and pepper. Roast tomatoes for 20-25 minutes, until tomatoes are soft and releasing some of its juice. Let cool. Reduce oven temperature to 375 degrees F. Place pine nuts on a rimmed sheet pan, and toast in oven until golden brown, about 5 minutes. Let cool. Meanwhile, bring a large pot of salted water to boil. Stir in pasta, and adjust heat to maintain a low boil. Cook for two minutes longer than the package instructions. Drain and rinse pasta in cold water until the pasta is no longer warm. 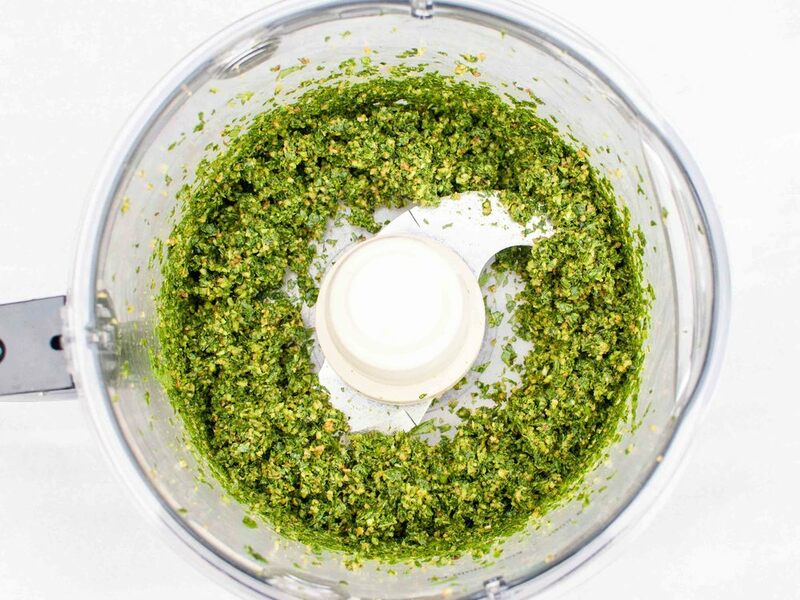 Make pesto: Combine 1/2 cup toasted pine nuts, parmesan, basil leaves, and garlic in a food processor or blender. Process until a paste is formed, stopping to scrape the container down as needed. With the motor running, drizzle in 1 cup olive oil, and process until the oil is fully incorporated and pesto is smooth. In a large mixing bowl, combine pasta, pesto, chopped parsley, sliced green onions, and remaining toasted pine nuts until pasta is evenly coated. Add half of the roasted tomatoes and half the mozzarella and toss to combine. Taste and adjust seasoning with additional salt and freshly ground pepper. Pour pasta salad into a large serving bowl, and arrange the remaining tomatoes and mozzarella on top. Serve at room temperature. California's El Niño dreams have been realized this winter. The rains that have drenched our drought stricken area have been numerous and plentiful. But in true California fashion, in between the blustery storm systems, we also had gorgeous clear days in the 70s! My husband has been telling me for years that he has SAD (Seasonal Affective Disorder). Like the amazing wife that I am, I laughed and teased him because I thought he was being dramatic. But this winter has brought out the SAD in me. As soon as a week of gray skies and heavy showers passed, the sun shone and warmed everything - including my cold, cold heart. 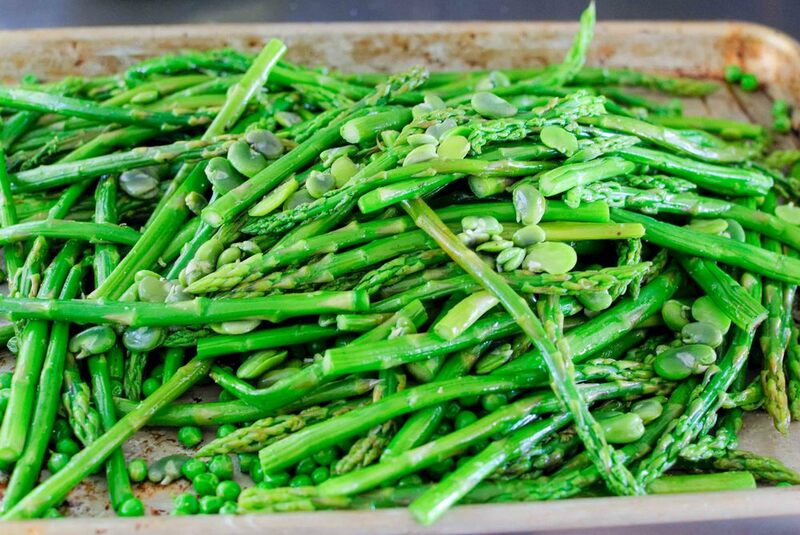 This sunny and bright herb-heavy side dish was a welcome relief from the chilly cold days. My husband aptly described it as, "preposterously herbaceous" and he is right (again??). Martha Rose Shulman of the venerable NYT Cooking Magazine, a.k.a. my spirit animal, named it a Chopped Herb Salad with Farro for a reason- the farro adds a savory chew but it's by far not the star of the dish. 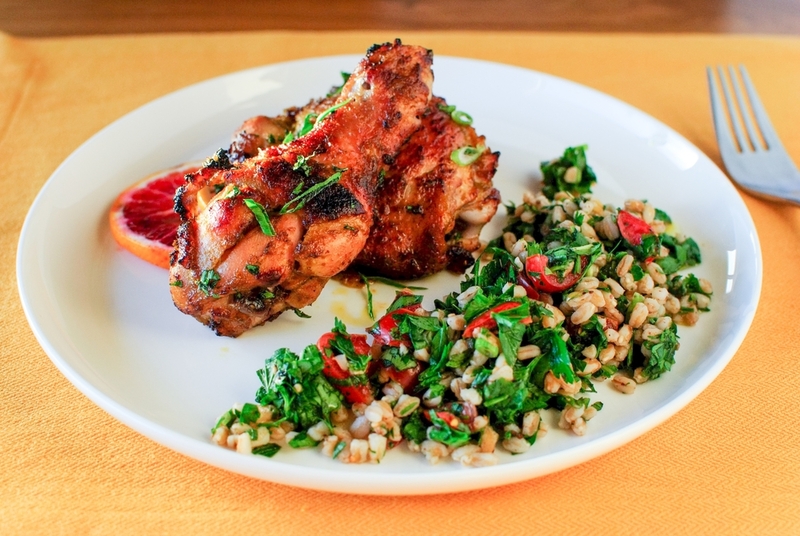 It was such a light and satisfying accompaniment to Amy's succulent Roasted Chicken Legs with Smoked Paprika, Blood Orange and Honey. Notes: I followed this recipe to the T and made no changes to the ingredients or preparation. If you are not convinced that the strong and fragrant herbs make an incredible salad base, I wouldn't judge you for adding more grains to suit your preferences. 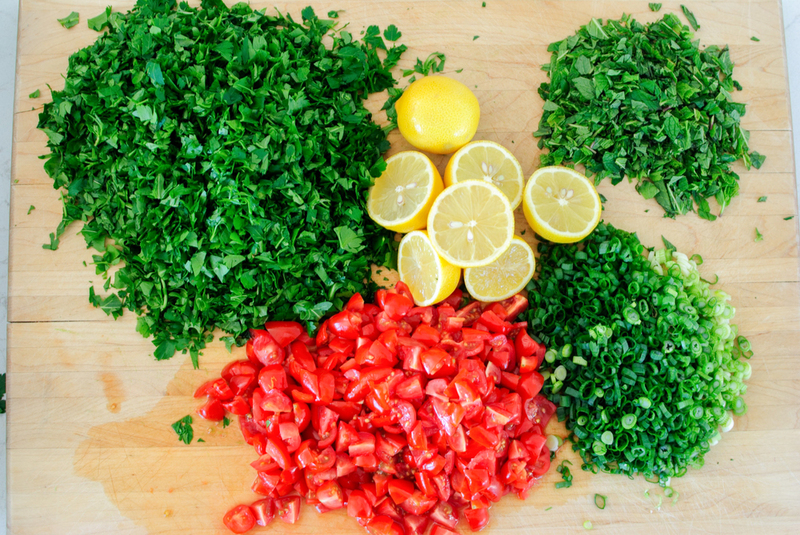 In a large bowl, combine parsley, mint, arugula and/or other herbs, tomatoes, scallions, farro, sumac, lemon juice and salt to taste. 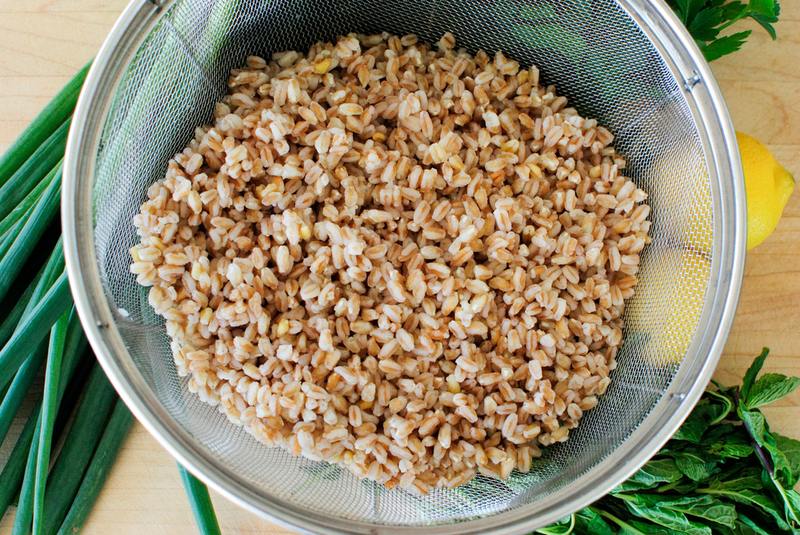 Refrigerate for 2 to 3 hours so the farro marinates in the lemon juice. Add olive oil, toss together, taste and adjust seasonings. The salad should taste lemony. Add more lemon juice if it doesn’t. I began the new year like a lot of people do - thinking about ways I could eat more veggies. I’ll share this tidbit about myself - I’m super picky about salad and dislike a lot of them, including creamy dressings. (I know, who doesn’t like Ranch or Blue Cheese dressing??? Just me.) I generally prefer my vegetables cooked; maybe it’s growing up in an Asian household where vegetables were just incorporated into the dishes we were eating. Anyway, January rolled around, and I felt like I needed to give this salad eating business some real attention. A kale salad was in order. Has kale salad been overdone? Probably. It’s seems like it’s on every menu that includes a salad these days. So, I wanted a kale salad that would be simple, not overly thought out, and well . . . delicious! This salad is just the thing. The main ingredient is kale, so you can feel really good about eating a leafy green vegetable, but this salad also includes a healthy dose of delicious aged cheddar, which is equally important for making this salad too yummy to pass up. Add a sprinkling of toasted almonds and a tart lemon vinaigrette, and we’ve got a really simple salad that tastes amazing. I hate salad. I loved this salad. Recipe adapted from Northern Spy’s Kale Salad. Notes: This salad is highly adaptable. Instead of roasted squash, you could roast carrots or sweet potatoes. In the summer, you could use fresh or roasted strawberries or peaches, and experiment with a soft goat cheese or dollops of good ricotta. I’m a sucker for salad toppings, so I’m always extra generous with the squash, nuts, and cheese. To make this salad vegan, omit the cheese, but add 1 to 2 tablespoons of nutritional yeast (found in health food stores), which lends a savory, cheesy flavor. If you are staring at the butternut squash thinking, “What do I do with this thing?? ?” here’s how to peel it. It’s tempting to buy those bags of pre-cut kale in the salad section, but to avoid having to masticate your greens like a cow, don’t do it! The kale pieces are too large, and they don’t remove the tough rib (stem) that runs down the center of each leaf. If you are reading this note too late, and you already have a bag of kale salad, never fear. Spend a few minutes to sort through the leaves to find the pieces with hard stems and tear away the soft leafy part from the stem and discard. 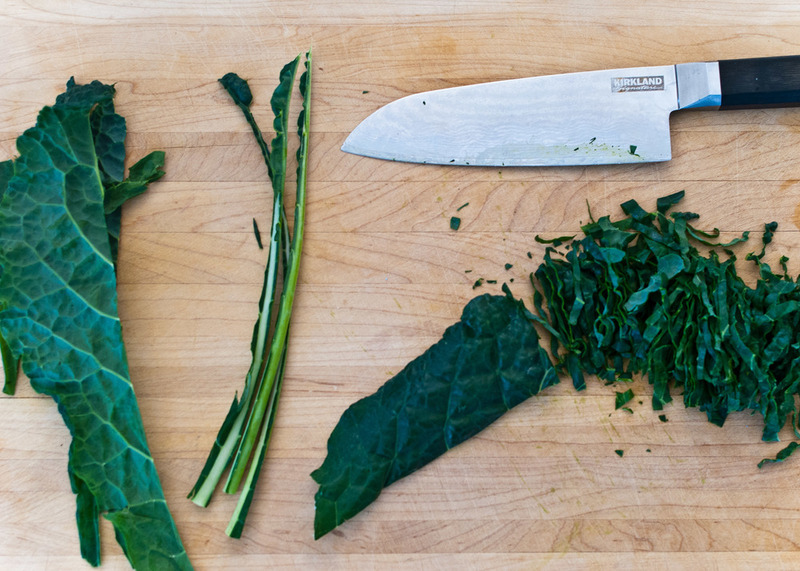 Then tear the leaves into smaller pieces with your hands (or use a knife). Lastly, sometimes both new and seasoned cooks alike, forget to taste their food before serving it. Add the salt, then taste it. Add additional salt and pepper until it tastes good to you. (I tasted the salad three times before I got it right.) The right amount of salt and pepper can change any dish (and especially salad) from ho-hum to wow! 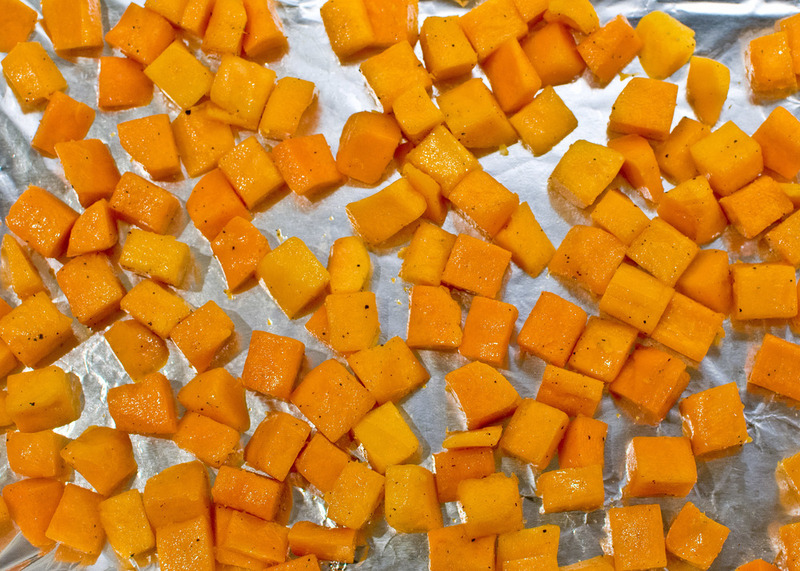 Heat oven to 425° F. Toss squash cubes in 1 tablespoon of olive oil to coat, and season with 1 teaspoon salt and ½ teaspoon pepper. Spread on a baking sheet (lined with parchment or foil for easier cleanup), leaving space between the cubes. Roast in the oven until tender and caramelized, about 40 minutes, tossing with a spatula every 10-15 minutes. Toast the almonds on a baking sheet in the same oven until they start to smell nutty, tossing once, about 10 minutes. Let cool. 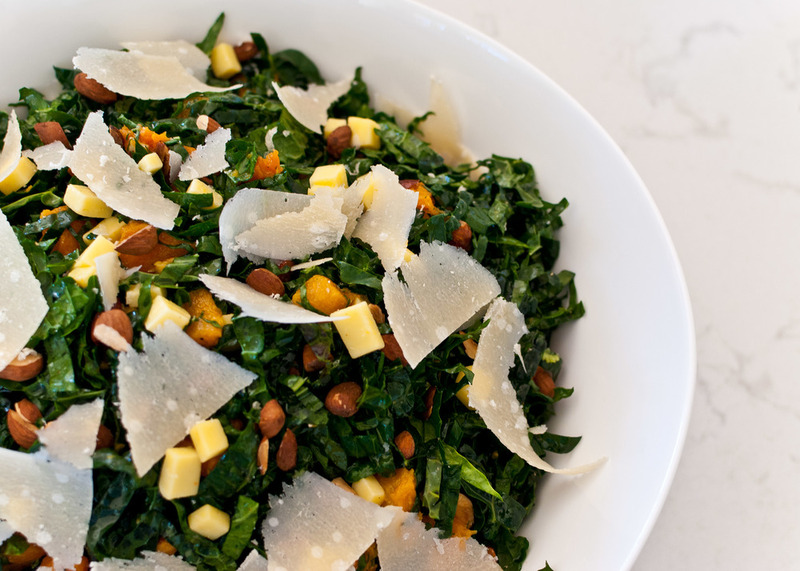 In a large mixing bowl, toss the kale with the almonds, cheddar and squash. Season to taste with lemon juice and olive oil (approximately 4 tablespoons lemon juice and 2 tablespoons olive oil). Season with 1 teaspoon salt and ½ teaspoon pepper, adding more if needed. Divide salad between four plates or shallow bowls. Garnish with shaved pecorino, if desired, and serve.